Since trying to drive in Japan near gives me a panic attack just to think about (I understand it’s an irrational level of anxiety, that knowledge doesn’t fix me) I instead adopted a much more pedestrian lifestyle while we’ve been living in Nagoya. Dare I say; I love it. I feel more active and healthy, hoofing around has made me more navigationally savvy, I see more cool stuff because I can let my eyes wander a bit instead of focusing on the road, and it makes everything I buy a VERY intentional purchase. Because I’m walking. And if I have to walk a mile or more back to our apartment, whatever I’m carrying better be something we actually have a use for. Since I’m physically carrying everything we need around this city (examples: groceries, clothing, dog food, laundry detergent, that one time I bought a bookshelf and carried it back home and pulled every muscle in my arms but felt so triumphant about it), I’ve ditched the idea of carrying a purse and have converted whole-heartedly to taking a backpack with me everywhere. Backpacks on adult, non-student people are much more common here than I’d ever noted back home. However, because it’s Japan, if you’re going to carry a backpack it needs to be fun and cute. 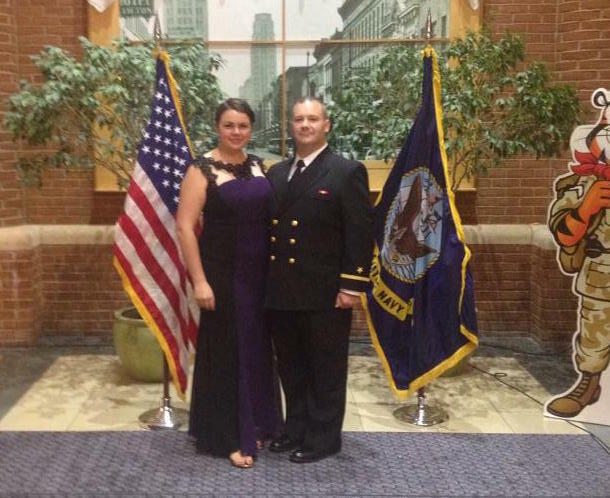 When we first arrived, my backpack was a takeaway gift we’d received from when the Kellogg Cereal company hosted a Navy Ball. five feet from a cardboard cut out of tony the tiger in fatigues. Needless to say, it was not adorable, and I am a little ashamed to admit how quickly I became wildly self conscious about my totally not cute backpack. And so I made an investment and purchased my beautiful blue starry backpack, roughly a year ago. 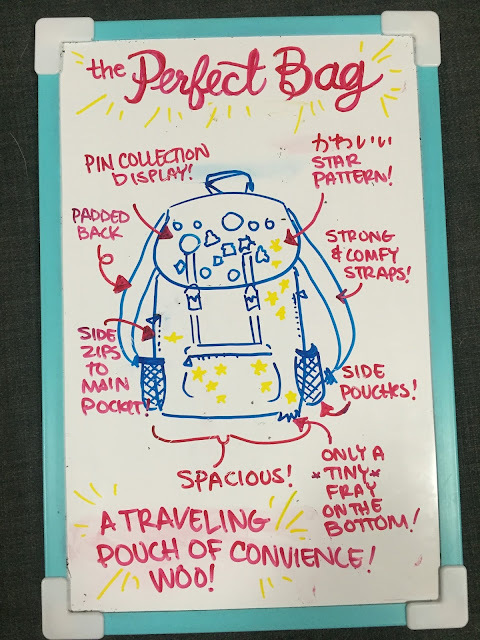 This blue starry backpack has proven to be the most perfect accessory in my life: It’s star pattern is cute, but not like, over the top for my American sensibilities. It has side-zippers so I can reach behind me and rummage through the main pouch to grab stuff without needing to take it off (very handy on trains). It’s got a padded back piece so that weirdly pointy thing I just bought won’t stab me in the back while I walk. It has two side pouches that hold my phone and my house keys/rail pass respectively. It’s big enough to act as an overnight bag on weekend trips, even with the way I chronically overpack. It displays my collection of pins from all the touristy places I’ve visited here (my solution for wanting souvenirs from cool places without accruing clutter) And I can fit $100.00 worth of groceries inside without the straps giving out while I walk or bike home. It is so choice. And now after a year of dutiful service, it’s finally time to retire my trusty blue starry backpack. Actually, maybe retirement has been due for a while now, but I couldn’t bring myself to make the decision. I figured my blue starry backpack would tell me when it was time. But it’s been looking a little rough for a while now - in fact, while my mum was here visiting she insisted on buying me a new bag even though I was adamant it was fine and the way the bottom seam was fraying was totally fine. I am a creature of habit, you see, and I didn’t want to have to get used to a whole new system of zippers and pockets. This blue starry backpack is perfect… how could I ever find anything that could replace this perfect bag!? How do you carry all your stuff around with you? What do you look for in a new bag/ purse/ wallet? Long story short… I ended up getting the exact same model. Thus, tonight I will be moving over my wallet, pocket umbrella and sketchbook. My lip balm, tissues, and schedule book. My sweat rag (if you live in Japan in the summer, you have one, don’t judge), hand sanitizer, and my pin collection. And tomorrow will dawn a new era - the era of the black starry backpack. isn’t that the same bag? For those who missed the memo, The Mister and I spent Golden Week in Cancun Mexico, to celebrate my little cousin tying the knot. 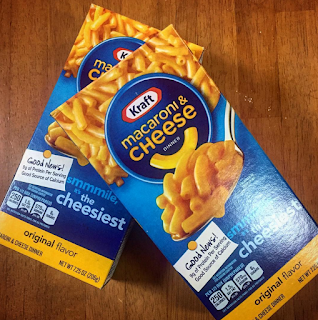 I’ve finally smoothed over the jet lag, thanks in part to KP2 who read my last post and came over three hours later with TWO entire boxes of Kraft Mac N Cheese which she had found. Have you ever stayed at an all-inclusive? I make a point on the occasions when I’ve been lucky enough to stay at an all-inclusive to be real upfront about rejecting extra charges. Upon check-in I immediately shut down the extra pitches: would you like to upgrade your room? Nope. Would you like to come to this breakfast where we try to get you to sign up for another vacation? Sashay Away*. Would you like to hear about all the fun things that cost extra in exchange for a bunch of coupons that are more or less meaningless? NO! And then I follow that up with pretending to be asleep anytime the sales people make their rounds at the pool. While I am 100% the person who will spend my time at a resort just belly up to the swim up bar, I recognize that I have married my opposite, and as such, he gets real bored of that in like, a day. The Mister is very good at finding stuff to do on the grounds - yoga, playing the games the activity director offers, checking out the night club. But we’re on vacation, and he needs a few opportunities to let his freak flag fly. Remember that one time last week I talked about how HORRIBLY sunburnt I got? Turns out the onsite spa offers a sunburn treatment… for an extra charge. Which I signed up for without batting an eye. That’s not The Mister being mean, that’s The Mister being honest. And I’m grateful for that skill set of his because… I mean, I got a massage, did you not read the above? 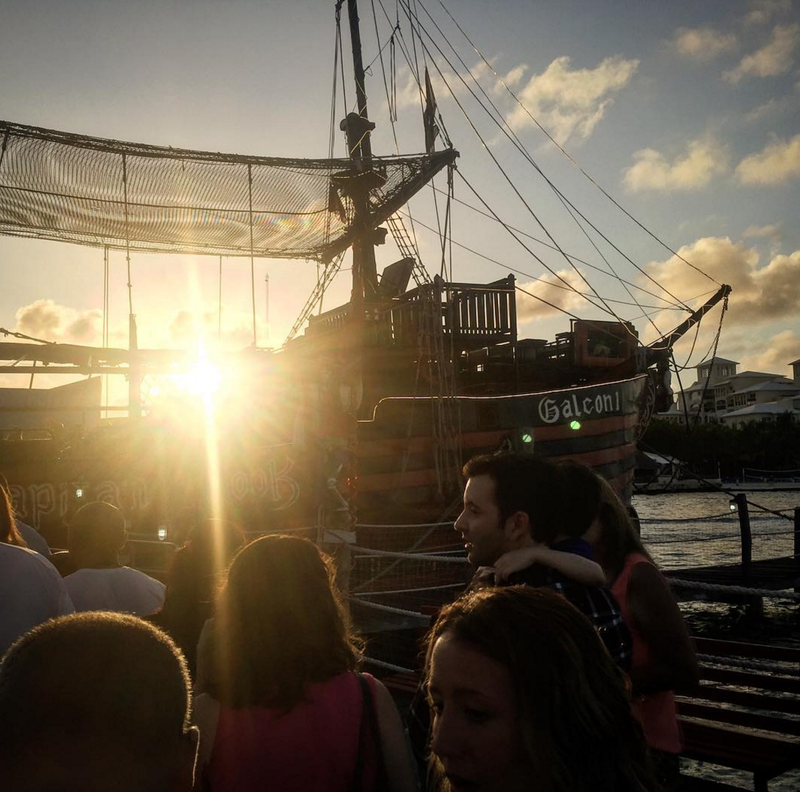 He also negotiated for the one off-site excursion we took: A sunset dinner cruise. Which is pirate themed. Aka - The Galleons of Captain Hook. Real talk, we took a gamble thinking this might be a stupid kiddie thing. And there *were* kids aboard… but holy cow did we have great time! It was like Medieval Times at sea! There were three ships that went out, and at the end of the night, they had a legitimate pirate fight between each ship over the “treasure.” There were games, dances, between the two ship masts they had rigged a space for an aerial silks performance, cir de solei style right over our heads in the middle of the ocean. Did I mention there was a pirate fight between other ships at the end? Listen, it was silly. 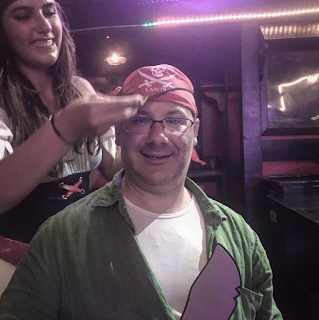 You should probably recognize that when you sign up for a pirate dinner show. But if you can be silly, I can’t recommend that trip enough. Donning the children's pirate kit he purchased. Silly is The Mister's middle name. It was our last night in Cancun and I’m so glad we chose that to wrap up our trip. Now I’m back in Japan* and ready to get back into the groove. SPEAKING OF THAT AFOREMENTIONED GROOVE! Are you in the Nagoya/ Chubu area? The Chubu Walkathon is this weekend, and I hope to see you there! The Walkathon is a charity event put together largely by the expat community of the area, and as this is the 25th year of the Walkathon, they’re going bigger and better than ever. This year also includes… are you ready? COOKIES. I’m in the middle of making a few hundred limited edition Walkie the Walrus character cookies that will be for sale (¥200, non-negotiable price. Proceeds to the Walkathon charity) at the event. 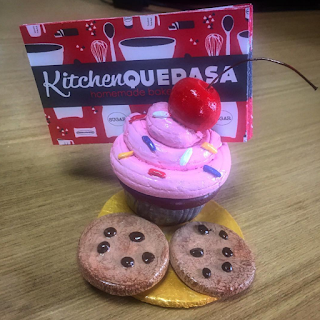 I’m SO excited to have my little budding bakery featured in this way and I’m doubly excited for the effort of all this baking go to such a great cause. Come say hi at the Walkathon on Sunday. Buy a Walkie Cookie. Help a good cause and get a delicious treat. I’ll see you there. 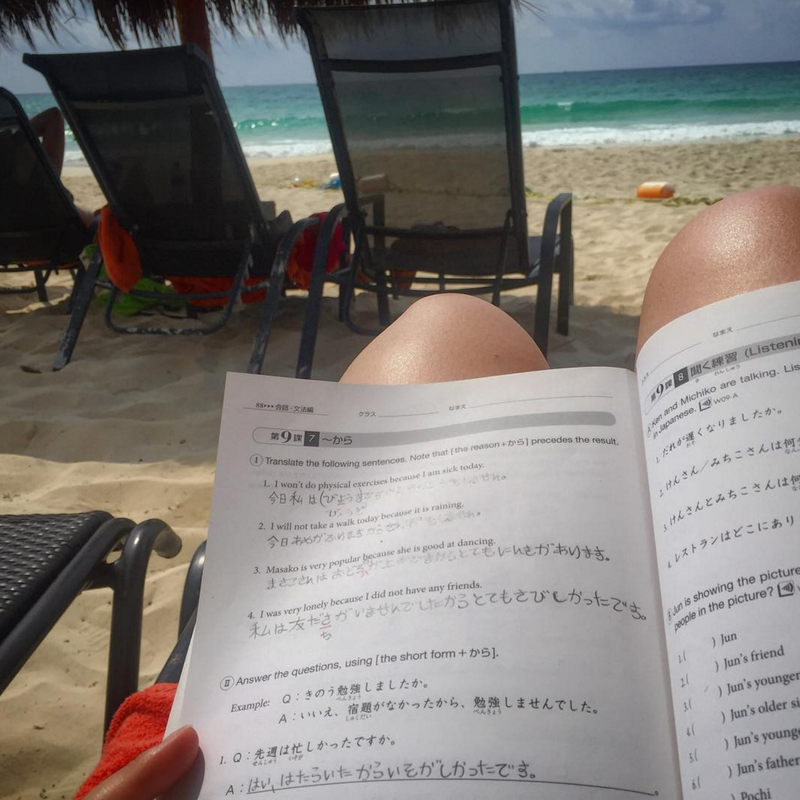 Cuando hubiste hablado español para dos semanas, su mente esta muy confundido a empezar a hablar Japonese una vez mas. When you've spoken Spanish for two weeks, your mind is too confused to begin speaking Japanese again. I’m pretty sure I am at a point where I would happily commit a heinous crime in exchange for one of those beautiful blue boxes of kraft mac n cheese in dino shapes. Jet-Lag: How does it manifest in your body? I seem to have a body that likes to deal with Jet-Lag on a roll of a dice: sometimes I do REALLY well! We landed in Cancun and were fine* within a day or so. *with regard to timezones anyway. just wait, we’ll get there. And other times (aka 5 out of 6 times), my whole body just goes on strike. Headaches, stomachaches, an acne breakout rivaling a 13 year old, a stupefying level of apathy to everything, and of course, inability to sleep at the proper time of day. This is compounded by my absolute inability to fly in a plane well, so that’s all coming at you directly after I spent 12 straight hours on a plane back to Japan curled in a ball trying not to hork and occasionally weeping in my pleas to my husband to please not let the flight attendants put food anywhere near me because the smell would 100% certainly make me vomit. 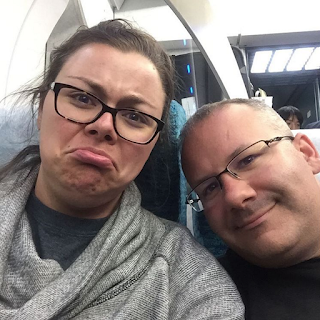 taken moments after clearing Japanese customs. Please note how unaffected The Mister is next to my miserable hot-mess of a person-hood. Moving on from macaroni; I’m back from Mexico and had a GREAT time! My little cousin got married in a beautiful ceremony, the reception was a blast, and I got to catch up with my family in a setting where no one had other stuff to run off and worry about. Plus, The Mister and I had some quality time to actually SEE each other without work obligations getting in our way. It was much needed. Plus, *now* I’m a nice golden tan, which as I’ve mentioned here on the blog before, is a highly valued dose of vitamin D for me. This contrasts sharply with Japanese beauty standards, which place high value on pale skin. In the summers, it’s not uncommon for me to be walking down the sidewalk sweating through my tank-top and shorts, as I pass by women wearing wide brimmed hats, long pants, parasols, and elbow-length gloves. 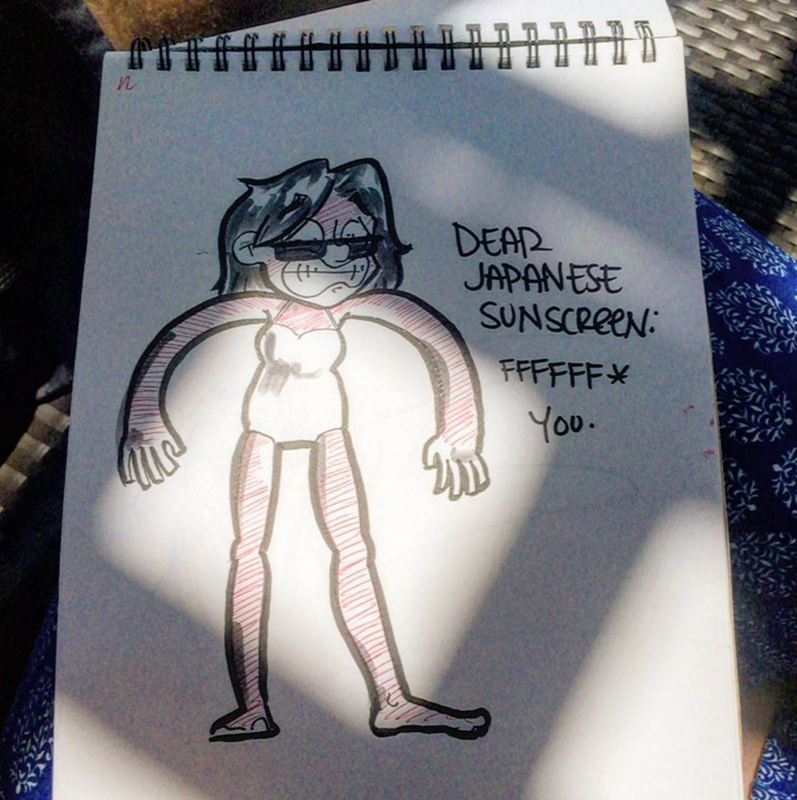 if everything is covered why would you need sunscreen too? Who am I kidding this was not the sunscreen's fault. In summary, I’m saying is that people here do not go tanning. There are a few outsider trends that buck that blanket statement, like Ganguro girls, but by and large, tanning isn’t well-accepted by the public. 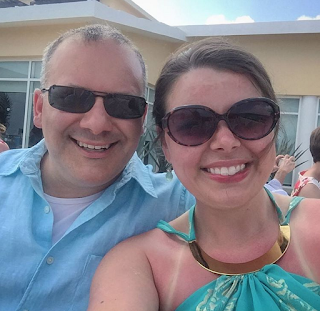 And so, before going to Cancun, I did no pre-tan. 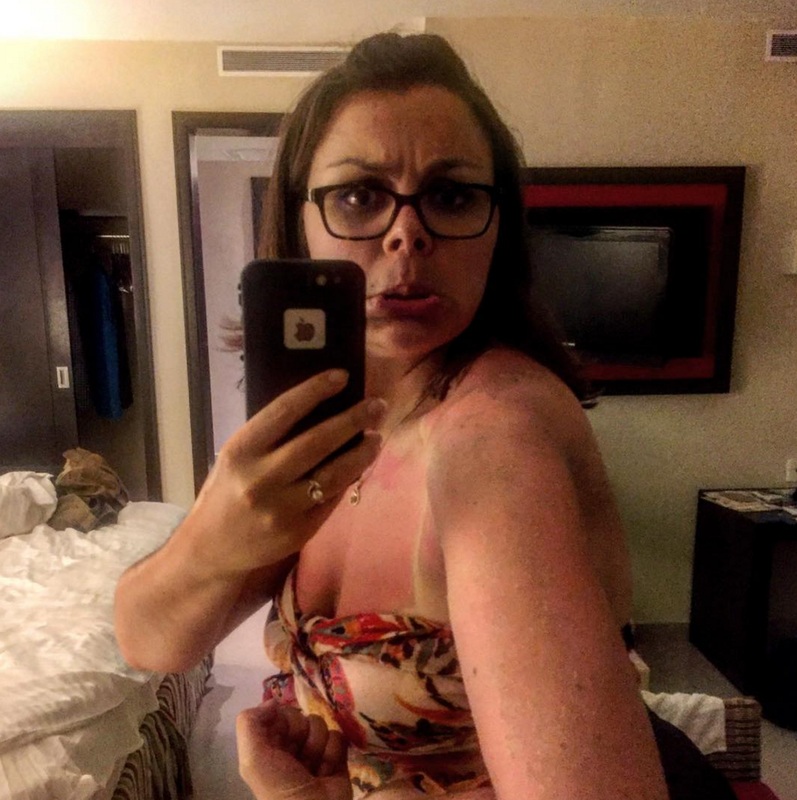 Sure, there are people out there who are capable of going on vacation in Cancun without having tanned beforehand, and who manage to not burn. I… have proven to not be one of those people. Simply put, I didn’t add up the math - if I didn’t do any tanning before the trip, as I had done before every other trip I’ve taken to Cancun, then I should not use the same sun-screen mentality I’d used on those previous trips. as this picture was taken I was slowly turning a vibrant crimson. Did you know if you give yourself bad enough sunburn that you get dizzy when you walk? You can’t eat? That aloe isn’t soothing but instead feels like you have doused yourself in lemon juice and salt? I didn’t go back outside to enjoy our all-inclusive beach resort for two days. I was a mess, and I deserved it for my own idiocy. LEARN FROM MY MISTAKES. Use so much more sunscreen than you think you need. Get a higher number than you can count to. Apply so much more often than you think you do. Ugh, you know this. You actually listened to Baz Lurhman. I can share, though, that if you’re going to a wedding ceremony and your sunburn has started to peel, you can put some coconut oil over the peely bits to make yourself not look like a shedding snake long enough for pictures to be taken. So that was good. I’m just about done peeling / fading from red to gold, and hopefully just about done having visions of making out with Cheesasaurus Rex. Now I just need to switch my head back from speaking Spanish into speaking Japanese again. Wish me luck! me gustaría a matar un hombre para macaroni y queso de dinosaurios. I would kill a man for macaroni & cheese dinosaurs. tune in next time when I wrap up the Mexico trip by talking about bird pirates, actual (sort of) pirates, and why I’m not allowed anywhere near The Mister when negotiations are happening.